Some people don't know this oh-so-cool plugin in Winamp, the automatic "Winamp Playlist Generator". It is powered by Gracenote (a big music database) and allows you to create a playlist similar to any tracks of your library, in two clicks and a few seconds (Well, it also needs hours of library scanning). 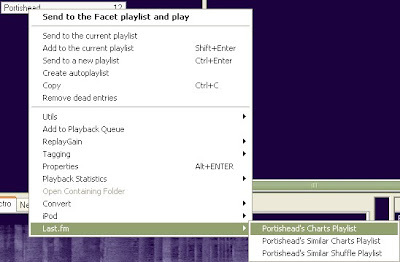 You can do similar things in foobar. Well, the following is the closest I found. It relies on the Last.fm database, but does not need a last.fm account. [artist]'s Similar Shuffle Playlist : generates a playlist of tracks similar to that artist. This is the closest I found from the Winamp plugin. [artist]'s Similar Charts Playlist: Generates a playlist of tracks similar to the artist, ordered by decreasing order of popularity in the Last.fm (weekly) charts. [artist]'s Charts Playlist: Generate a playlist of tracks by this artist, ordered by decreasing poplarity in the Last.fm (weekly) charts. 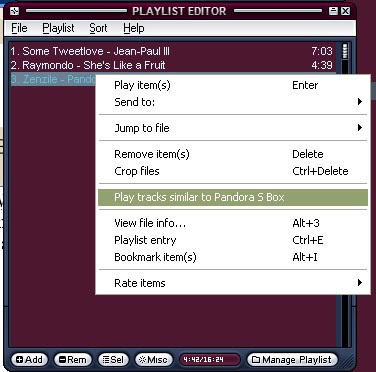 In the context menu of a selection of tracks in a playlist, you can order them by decreasing order of popularity. NB: For all this, you need an active internet connexion. If you want to listen to an artist-based playlist, you can listen to last.fm. But this plugin is also a good way to discover you library. I downloaded the plugin and put it in the components folder. But foobar200 wont find the plugin. I cant see it in the preferences, and of course I can't use it. Does this Plugin work with the latest version of foobar? Any idea what else i have done wrong?